What is a Folding Mobility Scooter? Why get a Folding Mobility Scooter? Best travel Folding Mobility Scooter? Best lightweight Folding Mobility Scooter? Folding Mobility Scooter vs. Standard Mobility Scooter? Everyone has the right, if possible, to move around freely, regardless of physical abilities. It should never be reserved only for some to get to go out, enjoy the sunshine, a family outing or a day at the local market, and with a folding mobility scooter – everyday activities become both easier and more enjoyable. Regardless of whether you have an injury preventing you from moving around, if your legs aren’t quite as strong as they used to be or if you just want some additional support – a foldable mobility scooter is a practical option that won’t have you falling behind. Folding mobility scooters are great options as they can easily be brought with you everywhere, regardless of whether you’re just heading down the road to the neighbor’s house or if you are planning an adventurous trip to Disneyland. Many models are great for both indoor use, some are designed specifically to be used outdoors and some are great to travel with, so it is a good idea to investigate a bit before deciding what product to get. An informed decision is a good decision, so let’s get out there to see what options there are, what foldable motor scooters are suitable for who and so on, and let’s get you up and moving around! Don’t forget you may need to invest in mobility scooter access ramps to use at home, or out and about. This is a model of portable mobility scooters that is both great looking, durable and worth its price. It is easy to assemble and made with heavy duty material, so that you won’t have to compromise when it comes to user-friendliness and safety. It is a light-weight folding scooter that is great for moving around both indoors and outdoors, and you can use it standing up as well as sitting down, which sets it apart from many other foldable scooter models. One single charge can transport you up to 20 miles, and this folding mobility scooter for adults has a top speed of 18 miles (a little under 30 kilometers) per hour. The 750-watt wheel motor is powerful enough to take you where you need to go, yet operates at a low and affordable cost. A padded fold-up seat with arm rests is sold separately. Why We Liked It – Investing in a light-weight portable mobility scooter is a great idea if you plan to take it with you to different places, and these heavy duty mobility scooters are both stylish looking and easy to fit into a car or on the bus or train. If you are always in the garden, you may wish to check out these top-rated garden scooters! A compact fold up mobility scooter with an automatic break system, that can be used both inside and outside the house. It navigates easily in narrow and cramped spaces, such as apartment complex corridors and crowded places, making it a great product no matter where and how you live, and where you plan to use it. Take this collapsible mobility scooter through a busy farmer’s market on a Sunday morning, or bring it in the car or even on the plane for longer trips! It has a key ignition, battery gauge and puncture-proof tires, has a load capacity of 253lbs (115 kg) and the powerful battery will allow you drive it for up to 9 miles (14.4 kilometers) on one single charge. The batteries can be removed so that you can charge them wherever you want, even without having to bring your compact mobility scooter. Why We Liked It -This folding electric mobility scooter for adults is easy to navigate and steer, even in very small spaces, which makes it a great option for the user that might not have the biggest apartment. For gas powered scooters, check out this 50cc scooter review. 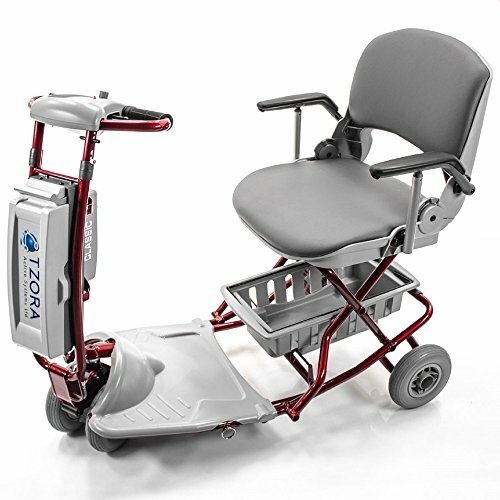 Here we have a 4-wheeled folding scooter for disabled, injured and elderly individuals, with adjustable tiller and an included Mobility Vinyl Cover. The folding travel scooter can easily be folded with 3 simple steps, thanks to the GO-GO Travel mobility scooter models’ unique collapsible design, and brought along for trips by both car, train, bus and plane. The GO-GO folding scooter can be stored both laying down and in upright position. 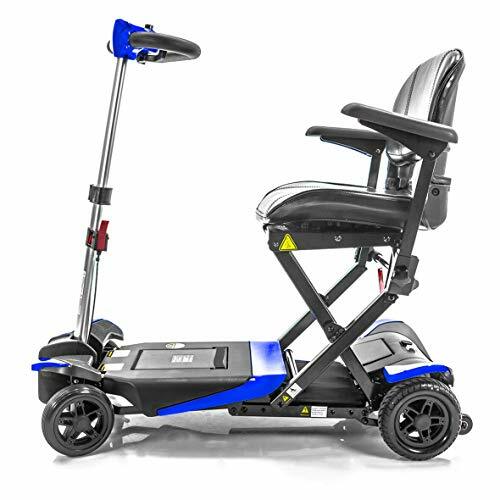 Not only is this GO-GO travel mobility scooter stylish looking, but it is also comfortable with its included large armrests and ergonomic backrest. This GO-GO folding scooter 4-wheel has a weight capacity of up to 250lbs, a max speed of 4 miles per hour and 12.5 miles range per battery charge. Why We Liked It – Big plus for this being one of the collapsible mobility scooters that come with an ergonomic seat and included arm rests for maximum comfort. 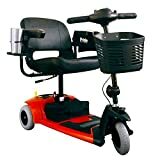 This is a great foldable electric scooter for elderly people, as it has both a cane- and a cup holder, so that you can bring your walking aid and your coffee with you wherever you go! The Transformer automatic folding scooter has automatic folding and unfolding which is handled with a remote control, it uses a Lithium battery that will transport you for 13,5 miles on one single charge and can carry weight of up to 300lbs. The Transformer automatic folding scooter is a one-of-kind type folding power scooter, and one of few mobility scooters that are completely electric in every way. These features make this automatic folding scooter an excellent choice for someone who might not have the movability to fold it manually and allows for a more convenient experience and an independent lifestyle. Why We Liked It – This Transformer automatic folding scooter is one of very few foldable scooters for elderly individuals that is fully electric, so that the user him- or herself can handle the folding and unfolding. Everyone deserves a chance at being independent and shouldn’t have to rely on others to have their scooters collapsed and stowed away. Extra plus for the cane holder on this folding power scooter. The active individual or traveler will love these fold and go mobility scooters, as they can be conveniently collapsed with a simple snap and brought along for whatever adventure lies ahead. It is easily maneuvered, can be stowed away for minimal space occupancy, comes with sealed lead batteries that are considered airplane safe (great for an airborne trip) and its total weight is only 46lbs. 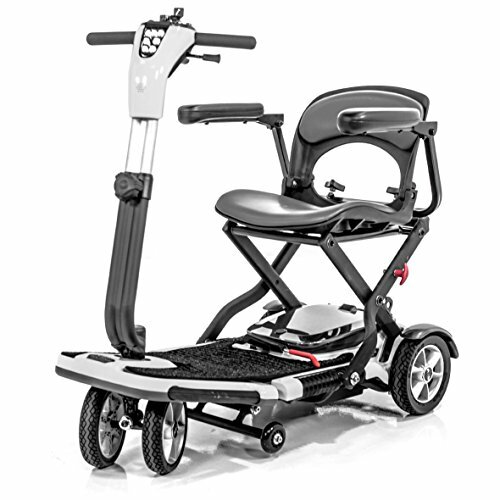 This lightweight folding scooter is also key operated and has a speed control setting so that you can choose if you want it to go the top speed of 4 miles per hour or if you prefer to set a lower limit. The maximum weight is 250lbs. Why We Liked It – This electric mobility scooter is a good choice for someone who wants to make their collapsible scooter a part their every day routine, as it is easy to take with you even on the plane or on a train ride. Want a faster ride? Check out the EW 36 electric mobility scooter from e-Wheels. 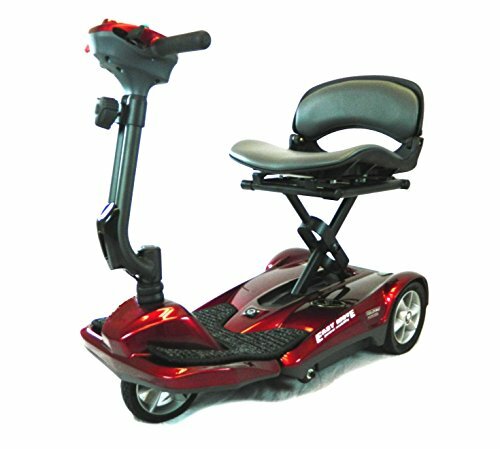 How about a European CE certified and FDA approved collapsible scooter? This product has electric and automatic folding, fits perfectly in the trunk of a car, it has a 250lbs weight capacity and comes in a trendy burgundy red color. This electric mobility scooter comes with a travel carrying bag and a certificate for air travel. These foldable mobility scooters are light-weight and highly transportable, they have speed dial control and a LED headlight for ultimate safety and come equipped with key ignition and a remote control for easy folding and unfolding. With a weight of only 44lbs with battery and 42lbs without – this foldable mobility scooter for sale online and in stores is an excellent option for the adventurous user. Why We Liked It – It is a mobility scooter foldable to fit in a small space or in a car, and great for both traveling and easy storage. It is also approved and certified by FDA and European CE. Fold or unfold these fold and go scooters in less then 10 seconds, so that you can get on to your next activity without hassling. They have a brand-new design and come in gray, red and black, making it easy to pick one that fits your personal style and preferences. Folding mobility scooters for adults shouldn’t just be practical, but they should be stylish as well, and with these great color options everyone gets a chance to pick the color that best represent them and their personalities. The foldable electric power scooter weights a total of 59lbs and does not take up any unnecessary space when collapsed, so that you can bring it with you everywhere no matter what you plan to travel by. Use it for a day downtown, to roll around the house or for an exciting adventure in another city. Why We Liked It – While slightly heavier than some other portable folding mobility scooters reviewed here, this product only takes seconds to fold and unfold, which is very convenient when on the go. 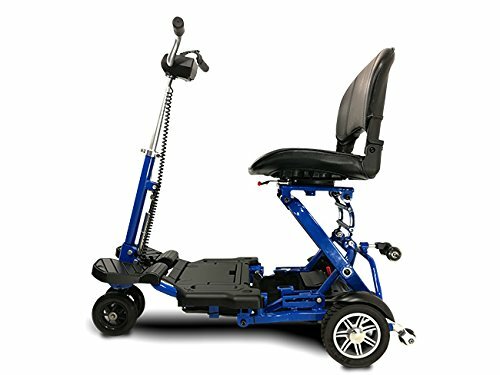 When looking for a foldable mobility scooter for adults, you will likely come across this beauty at some point. It weights 62lbs (28 kilos), has a weight capacity of 250lbs, it runs on 4 stable wheels that won’t ever go flat and it has a detachable battery so that you can bring it inside for easy charging. The wheels on this portable folding scooter are non-marking, which means it can safely be used both indoors and outdoors without leaving marks on the floor. You will find these lightweight mobility scooters for sale online as well as in select stores, and it is popular due to its sturdiness and easy fold and unfold functions. It also comes with a practical basket that goes under the seat, for storing small items, a handbag or similar. Why We Liked It – Finding the right folding scooters for disabled, injured or elderly family members, or finding one for yourself, can be difficult – especially when you might not know what to look for. This product combines sturdiness with an easy fold an unfold function, and it has 4 wheels which sets it apart from several other models. There are many folding travel scooters to choose from, and there are lots of exciting and practical accessories to get! This is a sunshade canopy that fits most well-known portable scooter brands, such as Golden Technologies, Pride Mobility and Merits & Drive Medical, and it attaches to the back bracket of the seat and is incredibly user friendly and light-weight. The height can be adjusted for the ultimate fit. This accessory is perfect for outdoor adventures on sunny days, so that you can shield yourself from those sunbeams while taking a walk downtown, during a visit to a theme park or while hanging by the pool. Why We Liked It – Sitting down with the sun beaming down on you can be exhausting and even dangerous, and it could easily ruin an otherwise great day. This product is easy for anyone to use, and provides shade over most folding mobility scooters for sale today. It is important to remember that a collapsible scooter for adults is not just for the elderly, or for those with visible disabilities. 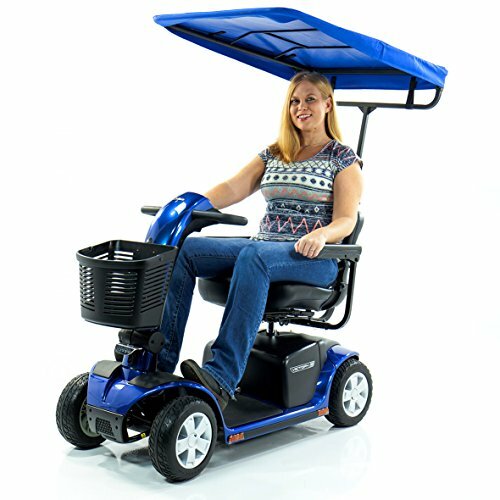 If you find yourself having to struggle to walk to the store, to stand up while your husband or wife browses rack after rack of clothes at your local clothing store, if you tend to say ‘no’ to an outing with friends or family because you worry about having to walk to much – then perhaps it is time to consider a foldable mobility scooter. Mobility scooters for sale can be found in many stores worldwide, but an easy way to compare products and to get an overview is by shopping for them online. Let’s have a look at what to look for, what to compare and how to know which product to purchase. There are different seat options when it comes to foldable mobility scooters, and it is important to look for a product that has what you need. Some come with armrests, which are great for safety and balance, and for some products you can choose to buy additional armrests that can be attached when needed. A few products also have the option to stand up while riding, something that can be convenient for individuals with poor circulation who wants the option of both sitting and standing. The top speed for a mobility scooter is the max speed with which it can travel. It is usually about 4 miles per hour, and some foldable scooter models have a setting where you can choose a lower max speed if needed. This can be useful for those that might have limited motor skills, as a safety measure, even though the regular top speed of a mobility scooter is rarely higher than what can be considered safe. It is important to take the maximum carrying weight into consideration, since this is the total weight of the user and whatever items or content is brought along on the foldable mobility scooter. The most common weight limit is 250lbs, at least for the average product, but some range up to 300-350lbs. A few select product are fully electric, which means that they not only run on an electricity charged battery, but also that they have a fold and unfold function that is carried out with a simple push of a button. For these types of scooters, a remote control will be included, and it means that no physical force or effort is needed to fold it or unfold it. Portable scooters are mobility scooters folding and unfolding at the convenience of the user. They are driven electrically to help those in need move around without difficulty and are constructed to work well both indoors and outdoors. Most portable mobility scooters for sale are made with a comfortable seat, which is perfect for long days out, but there are also models that will allow its user to stand up. 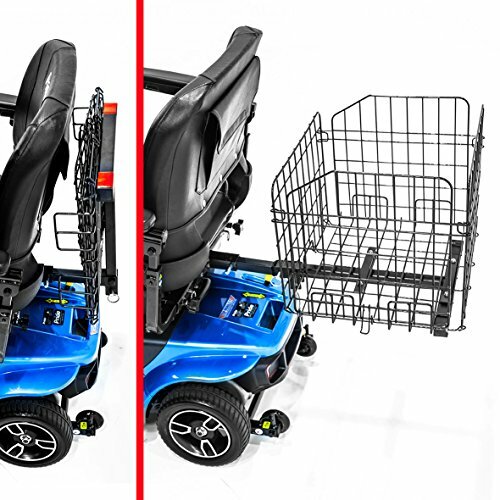 It is a mean of transportation that can help someone gain more independence and freedom, as it allows for injured and physically impaired individuals to participate in simple activities such as a fun day out with the family or a trip down the road to the grocery store. 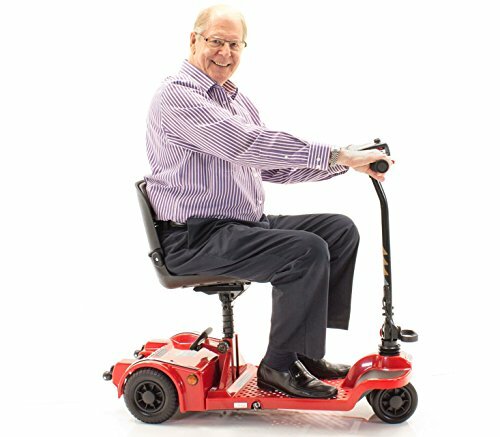 Getting portable scooters for disabled, injured, physically impaired and elderly individuals is a way to give them back their independence. 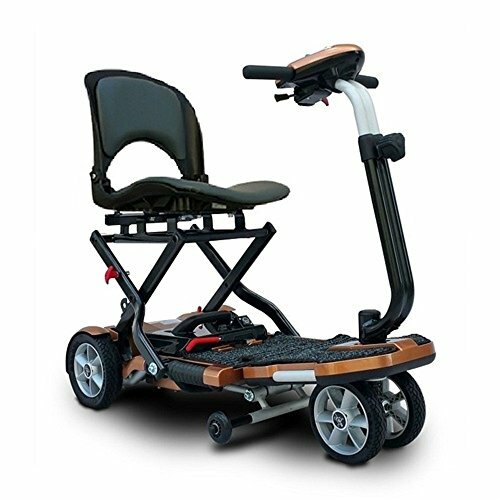 It transports you where you need to go without the need for walking or making an effort and can be used to move around the house or to head out for a bit of fresh air. Most models can go quite far without being charged up, and you can easily bring the battery charger with you if you would need to charge it when out of the house. Everyone should be able to go to the store at their own convenience, or to effortlessly move from the living room and into the kitchen, and this is something that can be achieved with a light weight folding scooter. The Heartway Passport is European CE certified and FDA approved, and it comes with a practical travel bag for storage, as well as a certificate for air travel. On top of this the travel mobility scooter collapses easily and can be stored in small spaces, such as in the trunk of a car or on the bus or train. There are many folding mobility scooters for sale worldwide, but this Heartway Passport travel mobility scooter has some unique features which makes it an excellent option for travel enthusiasts. The EV Rider weighs only 46lbs, and it can be collapsed and folded with one simple snap and stored in most places since it takes up very little space. Lightweight and small folding mobility scooters come in handy when wanting to take it with you on trips and in the care, but they also make great folding scooters for handicapped and physically challenged individuals, since many are able to easily maneuver them themselves. Perhaps you are not quite sure what you are looking for, so you type in something along the lines with “mobility scooters lightweight foldable” in your internet browser, without really knowing what difference it makes if the scooter is foldable or not. That foldable scooters fold is quite clear from the name, since you can pack them up for easy transport and storage, but what is the real difference between one of those and a standard mobility scooter? A standard mobility scooter is often sturdier looking and more compact, but it actually offers a very similar experience to most small mobility scooters for sale today. Folding scooters have the advantage of being more easily transported, so that you will never feel held back by a mean of transportation that is meant to liberate you. Regardless of what product you choose to go with, you will be surprised by how much easier life gets with a bit of help. A mobility scooter can be of aid when dealing with everyday tasks, such as grocery shopping, and it will help you get back to being as active as you used to be. Age, injuries and disabilities are no excuses for why you shouldn’t be able to enjoy your life the way you deserve to, so put some wheels on it and throw yourself out into the world again! Cheap mobility scooters can be just as high-quality and durable as a more expensive model, so just keep an eye out for the features you require (arm rest, top speed, battery life etc. etc. ), read reviews of mobility scooters and make an informed decision based on what it is that you need and hope for it to help you with. In 1954, the first mobility scooter was introduced to customers by Sears and Roebuck, but it didn’t gain much popularity and was soon taken out of production.